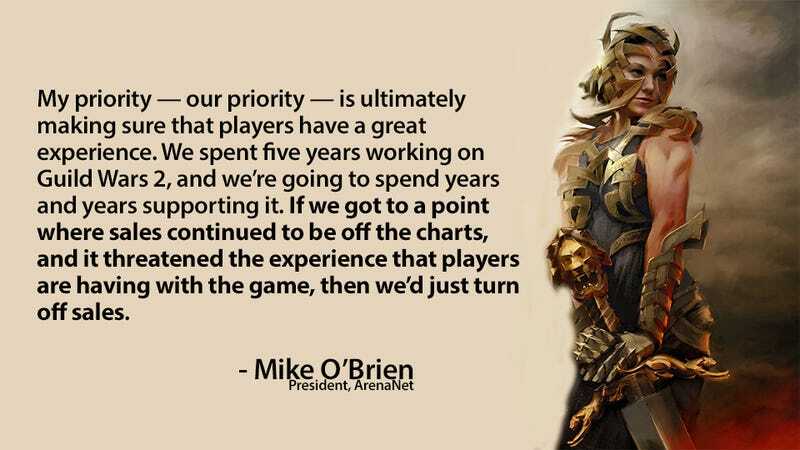 There's a reason I'm highlighting this quote from ArenaNet co-founder and president Mike O'Brien: you just don't see it anymore at the top end of the video game business. Pre-order money and first-month sales are everything for most publishers, and while Guild Wars 2 has had a big week - there were 400,000 people playing before it was even technically out - there's a limit as to how much money ArenaNet would bring in at the expense of breaking their servers. Guild Wars 2 Arrives Tonight. Here&apos;s Everything You Need To Know. The key here is that it's a long-term view. People having a bad experience with an MMO in their first week may never return, but many companies don't look past the initial sale or first month's subscription.Those enjoying their first experience will be back, and maybe back again, and again, until they're fans, who can then spread the word. It's patient, and it's smart.